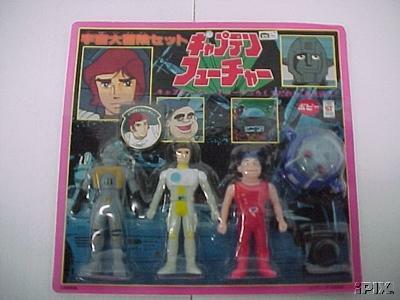 Japanese vinyl set of our heroes, made by Popy. Blistercarded, it has figurines of Flam, Crag, Mala and Simon. 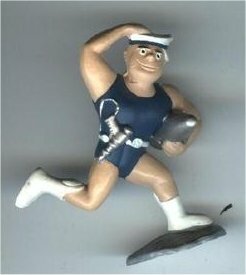 Rubber (flexi) figurine of Captain Flam. And girlfriend Johan ! The same figurines appeared blister-packed as well! Popy. 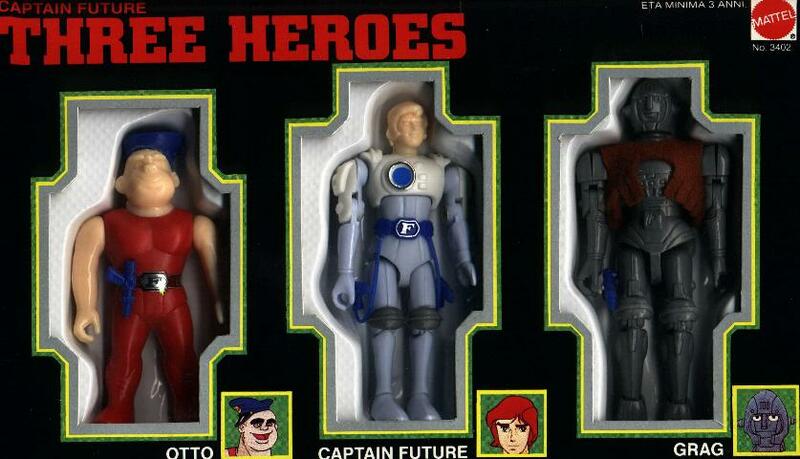 This is the Mattel box with the three heroes : Flam, Mala and Crag. 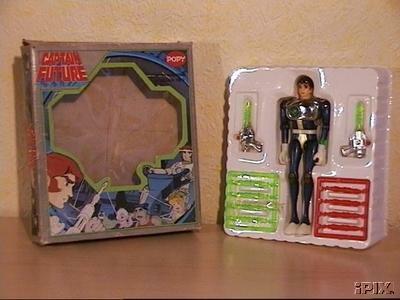 The same figurines are found in the Plastic Cosmolem set. 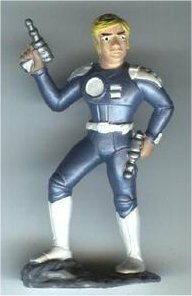 Another box (rarer) was produced with an extra figurine of professor Simon Wright. Mattel, BIG JIM-style Flam. It has real clothes, and two guns linked to his belt by plastic lines. 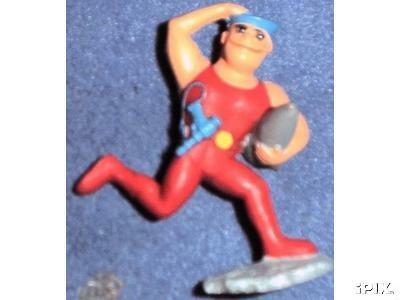 As all Big-Jims, he has the kung-fu grip and buttons on his back to action the arms. 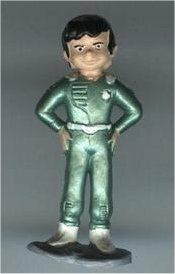 From Mattel, this is the metal (Italian) Grag. It has an English-(Italian) box, his little dog and non-shooting guns (the shooting gun - version was taken off the Italian market after more severe Children's-Safety regulations passed - the springs in the guns were believed to be an injury factor for children's eyes) Please check the differences with the japanese version, seen below. How to recognize one ? 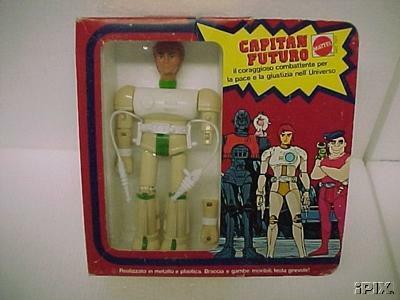 The Italian version came with only 2 hands, and the gun/projectile glued to one of them. This PVC Flam is made by Schleich, the same makers as the Smurfs figurines. This is Otto (Mala) in the same set. 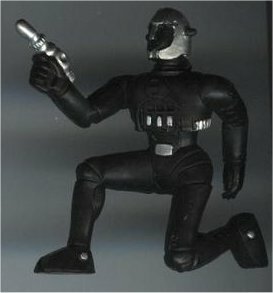 Poland made a number of bootlegs on the Scleich figurines. These Polish toys had a different color scheme and a little less details than the original Schleich versions. Here Flam. Johan got herself a nice bordeau uniform ! Ken something more greenish ! And Otto turned out blue ! Simon Wright - deceased scientist kept alive for world peace and direct adviser of Captn. Future. This toy, produced by Popy, here in the French box, is one of the coolest around ! 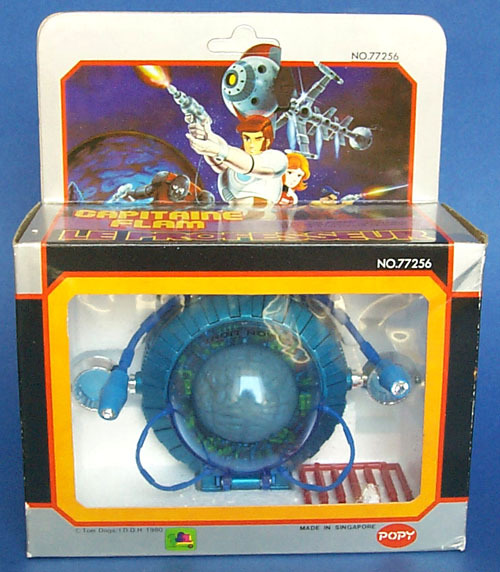 You can insert batteries and Simon's brains start blinking around ! Spooky ! It boast as well 2 missiles in the mouth-piece (weird - never seen him shooting in the cartoons) and flexible "Eye" units with little gemstones at the ends. German-Italian Popy box for the same toy. Note the color difference in the cables attaching the eyes and the back : they are red here. Weirdly enough, the color is NOT a sure sign whether the toy is French or German-Italian, since both color-schemes appeared in both packagings. The red-eyed one is believed to be the first, but also most common, with the blue-eyed being rarer. 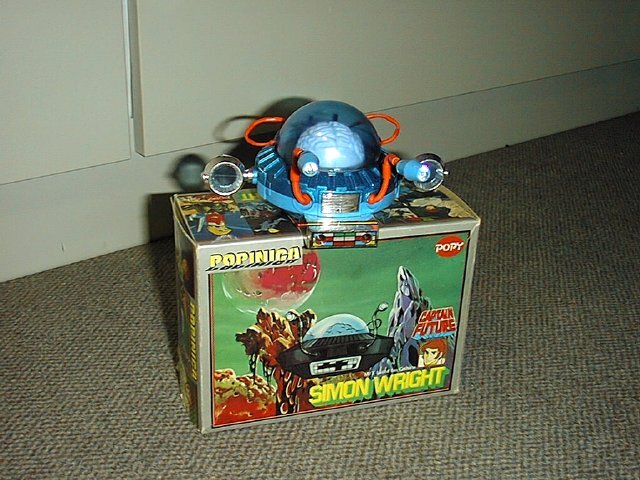 Simon Wright is a rare toy, as I understood that it was never available in Japan (thanks, Seb ! ), so my first thoughts about this being a Japanese version were wrong. 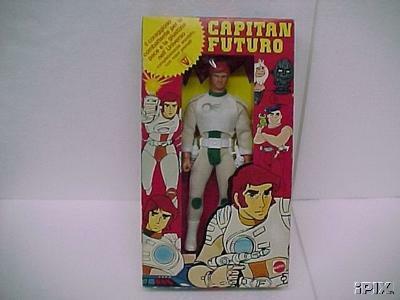 In the same serie as their Grandizer Actarus and Alcor dolls, and on the same figurine-base, Ceji produced this version of Captain Future. Very rare ! 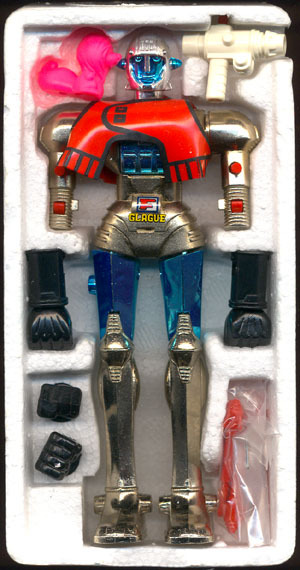 It was sold with plastic breastplate and two lazers. 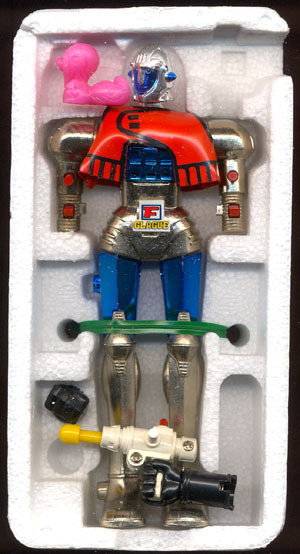 Like the Grandizer dolls, it has two buttons on the back to activate the arms. And like the Grandizer dolls, the joints break like crystal !